NEW YORK CITY, Oct 26, 2018 – GFNY got a warm, enthusiastic and welcoming reception in Playa Blanca, Panama on Sunday, October 21. 800 riders took part in the inaugural GFNY Panama, which is part of the GFNY Global Marathon Cycling Series. 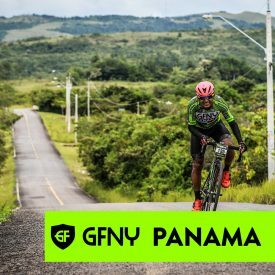 Starting from the mega resort, Playa Blanca, located 2 hours west of Panama City, on Panama’s Pacific Coast, GFNY Panama riders took on two course options of 170km and 90km. High adrenaline and damp tropical conditions resulted in a large, tight peloton heading out onto a fully closed lane on the famous Pan-American Highway at the race start. Once the adrenaline of the start and fast highway conditions dissipated, the peloton started to splinter and riders headed into 20km of challenging climbs. The climbs took riders onto the most scenic parts of the course and passing through several small, colorful villages, with every local resident sitting at their front porch, cheering on the riders. Local Panamanian rider Mohammed Mendez beat out the rest of the field to take the title in a time of 4:52:50. Carlos Ariel Saavedra Martinez was 4 minutes back in 4:56:35. Xavi Martinez rounded out the podium in 5:09:48. In the women’s race it was a fierce fight for the finish with Venezuelan, Marcia Barrios, just edging out local, Viatnessa Marin, for the win in a time of 5:33:17. Tatiana Sánchez rounded out the top three in a time of 5:48:33. Next up is GFNY Cozumel-Mexico on November 11.